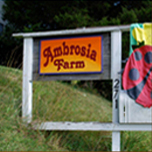 Ambrosia Farm Bed and Breakfast is located in the Blue Ridge Mountains of southwestern Virginia. 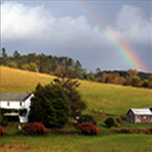 It is 3 miles from the town of Floyd and 3 miles from the Blue Ridge Parkway, about 5 miles from two wineries, Chateau Morrisette and Villa Appalaccia. 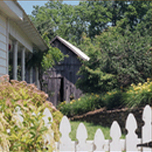 The inn is a completely restored 200 year old log built farm house. with a large pasture that offers beautiful sunset views. Antiques embellish the interior. There are two cabin rooms that are green built, made of hand-hewn logs. 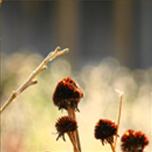 Wildlife abounds, and at any time you may see turkeys and deer. A large cherry tree adjacent to the porch invites songbirds to nest nearby. Cows mooing from the neighboring farm are occasionally heard while the subtle rushing of a nearby stream provides the backdrop for otherwise silent serenity. A spring on the property, once used for the needs of the farm, has been enhanced with a pleasant sitting area, offering the songbirds a place to drink. We have customized art-related activities for all ages throughout the year. We also offer wireless DSL.